This week we are going to give you lots of inspiration using a Love theme. 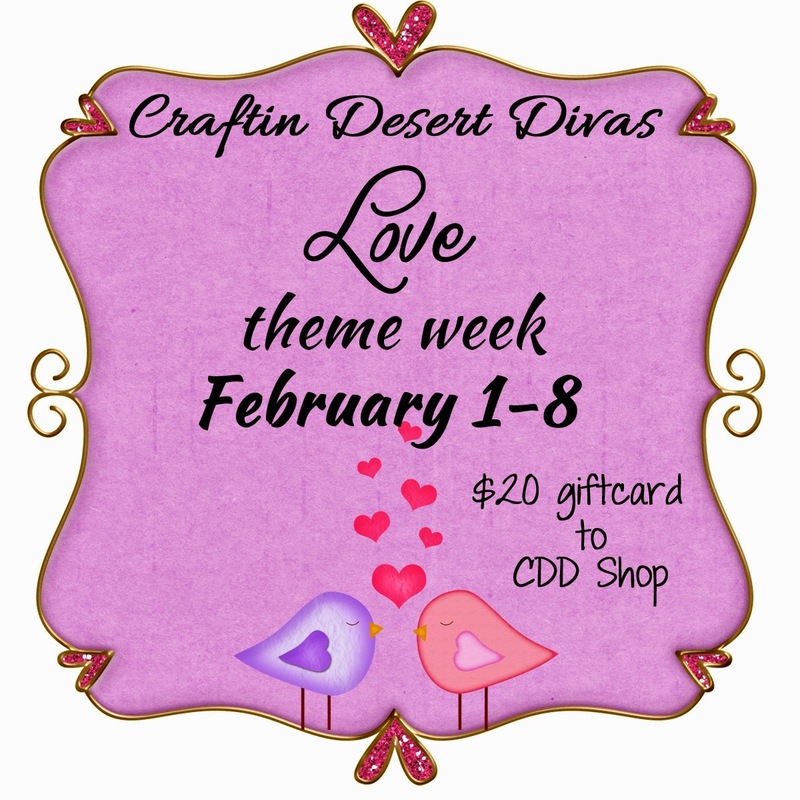 One winner will be picked from the comments using random.org for a $20 gift card to the CDD Shop. All you have to do is leave a comment here. Winner announced 2/9. Nanne here today to share a masculine Valentines Day card I created using the "Be Mine" sentiment from the "Sending Love" sentiment stamp set from Craftin Desert Diva's. My husband and I will be celebrating our 19th Wedding Anniversary on Valentines Day this year and well, I think he deserves one of my hand made cards :) So, this is for him.. I love primitive country style crafts, so I wanted to use that as the theme to my card..
side view of my card, I added some layers using foam tape and then tucked the twigs behind my big star.. I created the circle tag with two circles and a punch in the middle, created all of my die cuts in the SIL software and cut them with my Silhouette Cameo. and you can buy it HERE.. I like the twigs that turned out rather nice. What a beautiful card. I love the country style. I need to try something like this for my hubby for our Anniversary. This is just gorgeous!! Love it. Very nice card! The key to any man's heart! Very cute card, love all the detail. Love your primitive Americana card and a Happy Anniversary to you! Absolutely beautiful! Love the vintage, primitive feel! How fun to have your Anniversary on Valentine's Day! Great card~I am sure he will love it! Happy Anniversary Tara and Hubby. I just love this card It really gorgeous!! Like the Patriotic vintage look of this. Especially like the key. OMGosh I LOVE this. Thanks for sharing. Wow fabulous card. Love all the details.